Over the past several weeks, I’ve needed some “merry water,” and when I saw a bottle of Erik Kormann Eau de Fröhliche (fröhliche is German for “merry”), I smiled: the bottle features an image of one of the merriest creatures on earth — a pug. Apart from frankincense, Eau de Fröhliche contains raspberry and other fruit notes, cardamom, iris, dark chocolate, vanilla/tonka, tolu balsam, patchouli and rosewood. Prop up your feet and relax: Eau de Fröhliche takes its time in segueing from one phase of development to the next. Eau de Fröhliche begins sweet, with the scents of a chocolate shop (imagine the aroma of dark chocolates filled with lemon cream and raspberry jam). The fragrance takes its time in shedding the sweet-shop vibe, but slowly I detect a touch of spice and a hazy and sheer wood note. In mid-development, “smoke” (from a nearby roaring fireplace?) infiltrates the candy shop and mixes with Eau de Fröhliche’s sugary chocolates and raspberries (an “energetic” scent mixture). From smoke, the fragrance proceeds to its main ingredient: rich frankincense. Eau de Fröhliche’s incense base is vibrant and dark: a great blend of resinous pine-fir aromas, benzoin smoke/ash, and background notes of tonka, chocolate and raspberry. Eau de Fröhliche “burns” and becomes more incense-y as it wears on skin, and it ends with a smoky-but-smooth, almost talc-y character. Eau de Fröhliche is a great and happy ”holiday” frankincense perfume without the usual ”church” associations. I never thought I’d like frankincense mixed with chocolate and fruit, but it works. Now, if I could only get another PUG in my life, I might be really merry. Erik Kormann Eau de Fröhliche has excellent lasting power and sillage and is available in 50/100 ml Eau de Parfum, €65/130. 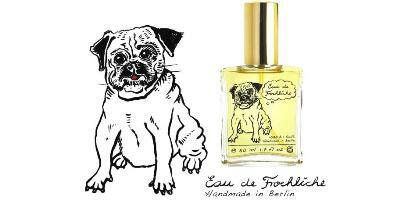 Eau de Fröhliche is sold online at First-in-Fragrance (Germany). 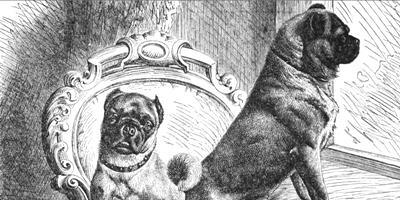 Note: top image of pugs [altered], via Wikimedia Commons. Elizabeth: good to know! Thanks. Thanks for the link, E.! Beautiful! A particularly timely review -thanks! This sounds like one that I really want to sample – mainly because I can’t imagine that combination of scents. I’ve been wearing SSS Incense Pure quite a lot lately. That one is much more peaceful and restful than merry! Rappleyea: I’m tempted to buy a bottle for fear it will disappear after the holidays/winter. Your review makes this one sound tantalizing, but what I really wanted to say is: What Amazingly Darling Pugs! There’s nothing like picking up a pug and giving him a gentle squeeze and smelling that wonderful puggy smell. Angela: I know…wish I had one to hug and squeeze now. Seattle streets are full of jaunty pugs though…. You are so right, Kevin. I remember meeting a particularly jocular one at the Bartell Drugs on Lower Queen Anne. His name was Bosley. I wouldn’t be surprised, actually. lol Bosley is a great name for a pug, but he’s the only one I’ve met so far with that moniker. I am really excited about this fragrance. I love the play on the name and the the frankincense has a new twist. Delightful! I must look into it. I love pugs, they are one of my favorite dogs. Little squished up faces and that curly tail..just so adorable. I had a neighbor who had a pug and it was the cutest thing, it loved playing with this stuffed animal that was at least twice the size of the dog. It was this really big stuffed bear..too cute. Don’t think I’ve met a mean pug. I love them! I’d love to try a sample of this fume as well:). Omega…hoping a US distributor will pick it up. I am loving the sound of this scent but am trying not to pay too much attention, since my chances of coming across it are rather small. Nice review, though! I love the idea of a fun twist on frankincense, but that raspberry has me leery. Pugs, however… oh, pugs! I’m not even a dog person, but I adore ’em. Their little faces always seem so… concerned. Lilydale: concerned one minute…fiddle-dee-dee the next! HA! The raspberry jam note is LIVELY…not “simmering” in case that makes a difference to you. Those notes sound so interesting! Perhaps they’ll have US distribution some time? Oh, best bottle of the year – and among the most intriguing notes, as well! Noz: I had to smell it when I saw the bottle AND the quirky notes. You have me interested, Kevin, and I especially love the description of the drydown. I love pugs, too, but I like them even better a little diluted. One of the best and sweetest dogs I ever had was a pug/dachsund mix. She had the enormous Peter Lorre eyes, but no squooshed face (and so no breathing problems), just a shortened snout that made her look perenially like a puppy. I’ve never been able to find her like again. Alyssa: I bet…that’s an unusual mix. This just sounds so delightful and different! I am all about the frankincense, so I hope I get to try it soon. Donanicola: hope you like it…the scent of raspberry has grown on me this year…. What an interesting and enjoyable post as always, Kevin. Sounds like a lovely perfume to wear right now. Anna: thanks, the weather here is Seattle IS nice and cold and FOGGY…perfect frankincense weather.